About Surf Lessons Hossegor. Troy Ferry 35 Years Experience. High Quality. A little bit about Surf Lessons Hossegor and how it came about. Troy ferry was born in Brighton in 1967. He was lucky enough to be there for the birth of skateboards. He soon became a pioneer of British bowl and vertical skateboarding, but decided to focus his talent on surfing. He learnt to surf in Brighton at the age of 9 and at the age of 16 left the pro skate scene and moved to Newquay to focus his talent on surfing. He won several British contest before he started his travels . Hungry for better waves at 17 he made his first trip to Asia in search of perfect waves. Over the course of the next 30 years he spent his time searching for the best waves on the planet. Having lived in Austarlia , USA , and Asia he decided to put roots down in Hossegor France. This was one of his first and favourite surf destinations, offering a wide variety of waves including the world class waves like La Gravière. 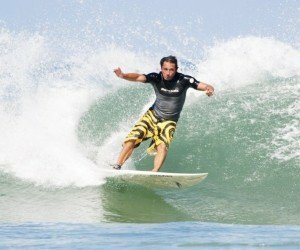 Deciding to stay in France Troy created Surf Lessons Hossegor in order to fill a gap in the market for high quality custom made surf lessons. No more lessons with fifteen other people and sub standard used equipment. Surf lessons Hossegor is a unique surf coaching experience for you and your friends to learn to surf in a fun and safe environment at a pace that suits you. For more information please View Prices Page or Contact Us.